Provide comfort for the family of Marie Byers with a meaningful gesture of sympathy. Marie A. Kaliszewski Montgomery Byers, 78, formerly of Erie, passed away peacefully Tuesday April 2, 2019 at Allied Skilled Nursing and Rehabilitation Center in Scranton, PA. She was born in Erie on August 17, 1940 a daughter of the late Valentine W. and Theresa Wiercinski Kaliszewski. Marie graduated from Academy High School in 1958 and worked as head bookkeeper at American Motors for six years. She was a former member of Christian Assembly where she was head of the Women's Ministry and taught Bible Study. 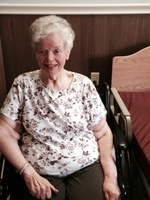 She belonged to the Golden Girls Card Club and enjoyed embroidery, crocheting, reading the Bible, and playing cards. In addition to her parents she was preceded in death by her husband, Charles H. Byers, Sr.; two daughters, Theresa Janicki-Engberg and Valerie Davis-Crane; two grandsons, Justin Janicki and Michael Evans; one brother, Valentine "Tom" Kaliszewski; and her son in law, Joseph Person. Survivors include one daughter, Kimberly Evans and her husband, James, whom Marie lovingly referred to as her son, of Lake Ariel, PA; a stepdaughter, Sharon Lynn Person of Erie; nine grandchildren, Leslie Hollenbeck, James Evans (Shelly), David Janicki (Angelica), Mary Evans-Considine, Christopher Janicki-Howe (Dave), John Crane, RyanLynn Allen (Lindsey), Marcel Evans, and Allyxia Evans; 11 great grandchildren; one brother, Joseph Kaliszewski and his wife, Pat, of Erie; a sister in law, Nancy Kaliszewski of Erie; and many nieces, nephews, and cousins, including Barbara Narducci and her husband, Louie, with whom Marie was very close. Friends may call at the Russell C. Schmidt & Son Funeral Home Inc., 5000 Wattsburg Rd., on Sunday from 2 to 4p.m. and 6 to 8 p.m. and are invited to services there on Monday morning at 10 a.m. officiated by her daughter, Kimberly Evans. Burial will follow in Wintergreen Gorge Cemetery. To send flowers in memory of Marie A. Byers (Kaliszewski), please visit our Heartfelt Sympathies Store. Provide comfort for the family of Marie A. Byers (Kaliszewski) by sending flowers. Marie was one of the sweetest women i have ever met. She became a true friend to my mom while she was @Allied for 6mos. & Marie was so kind to her in her final weeks. Marie would always come to visit & say special prayers for her. They were pinochle buddies. i appreciated Marie's sincere friendship to me & My mom. i loved going back to visit her, Claire, Sandy, Flo & Mary. Marie so enjoyed seeing Greg Palmer perform there every month. when he find out Marie was not well enough to come down to see him he came to her room & she perked right up when she saw him. she will surely be missed by so many there. We all loved Marie. Greg will be there this coming Sunday & he is going to dedicate a song to her in heaven. She will always remain n my thoughts & prayers. May she now rest in peace in God's loving arms.